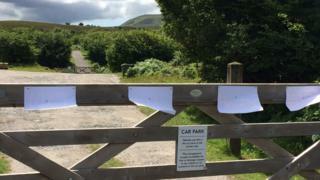 A car park at a popular mountain walk in County Fermanagh has re-opened after it closed to visitors in July. Fermanagh and Omagh District Council confirmed that the car park at the Cuilcagh Mountain wooden walkway has re-opened under private ownership and people using it will be charged £5. The car park closed on 20 July. Those already parked at the site found themselves locked in while later arrivals could not gain access. It is understood the closure was because of a land dispute with a farmer who lives in the area. The walk, known as the "stairway to heaven", has been hugely popular since it opened in July 2015. It opened to protect a sensitive area of bogland and restore areas of peatland that had been eroded in a special area of conservation. The number of walkers in the area has risen dramatically from fewer than 3,000, before it was built, to 24,000 in 2016.